‘A common tactic’. 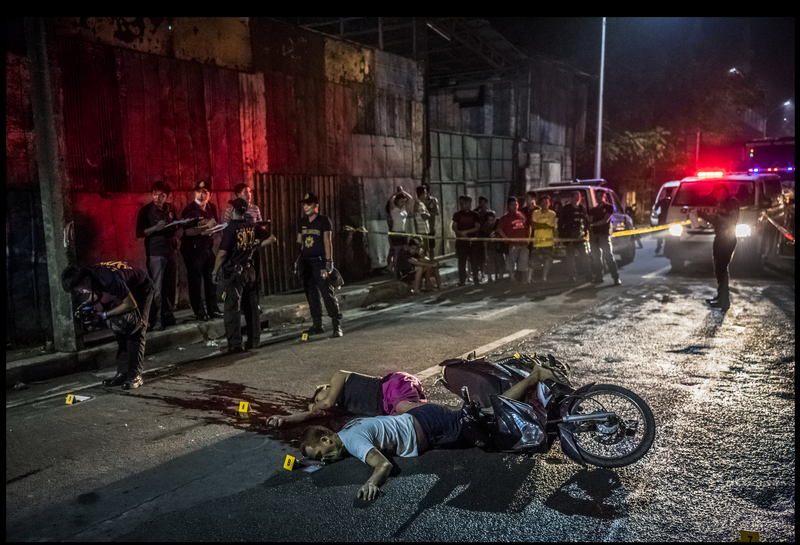 Frederick Mafe, 48, and Arjay Lumbago, 23, were riding together on a motorbike when they, too, were killed by a pair on another motorbike. ‘A father’s funeral’. 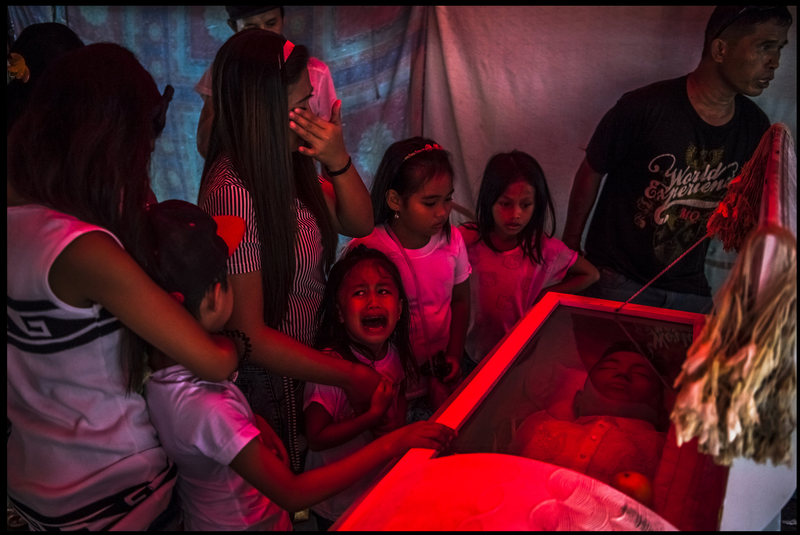 Jimji, 6, cried out in anguish, saying “Papa” as workers moved the body of her father, Jimboy Bolasa, 25, for burial. Some bodies were found on the streets with their heads wrapped in packing tape. 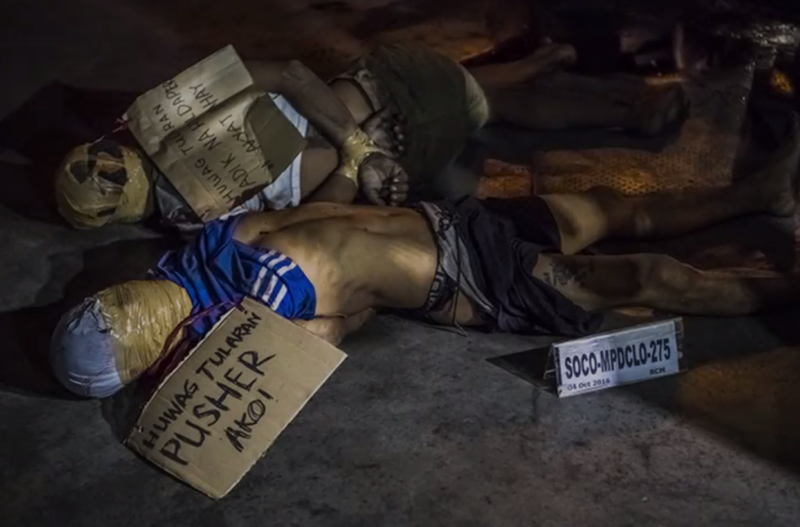 Others were left with crude cardboard signs labeling victims as dealers or addicts. That is what happened with the two men in the video below, which was captured by a security camera outside Santa Catalina College, a private religious school for girls. More than 35,600 people have been arrested in antidrug operations the government calls Project Tokhang. The name is derived from a phrase meaning “knock and plead” in Cebuano, Mr. Duterte’s first language. In affluent neighborhoods of gated communities and estates, there is, indeed, sometimes a polite knock on the door, an officer handing a pamphlet detailing the repercussions of drug use to the housekeeper who answers. In poorer districts, the police grab teenage boys and men off the street, run background checks, make arrests and sometimes shoot to kill. 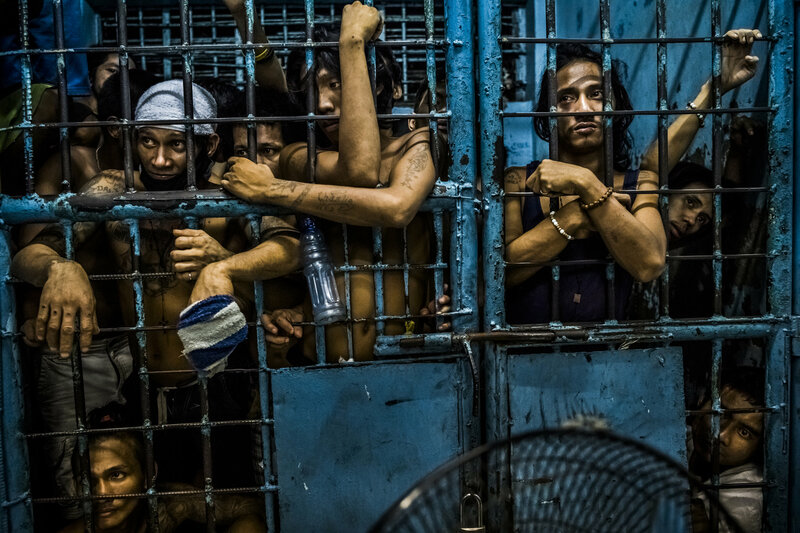 Inmates at a Manila police station watched as more drug suspects were processed after their arrests. ‘Hiding their shame’. Four men arrested for possession of drugs covered their faces from my camera. 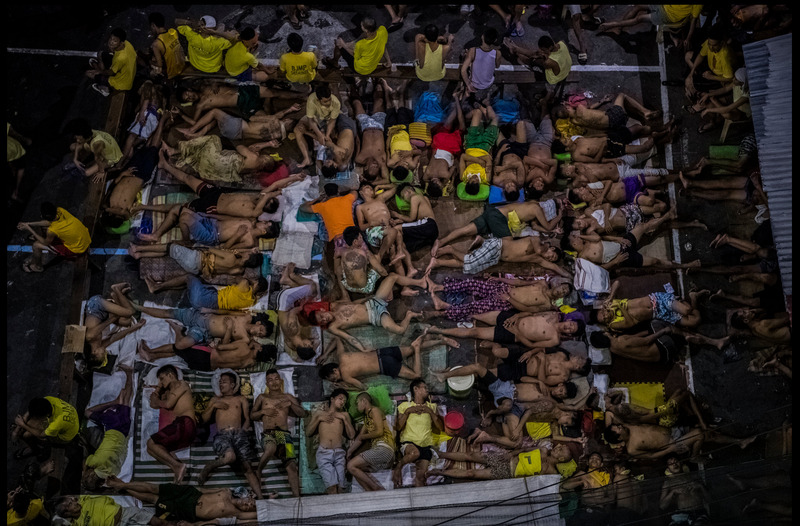 My nights in Manila would begin at 9 p.m. at the police district press office, where I joined a group of local reporters waiting for word of the latest killings. We would set off in convoys, like a train on rails, hazard lights flashing as we sped through red traffic lights. I kept daily diaries and audio recordings of these overnight operations, working with Rica Concepcion, a Filipino reporter with 30 years of experience. 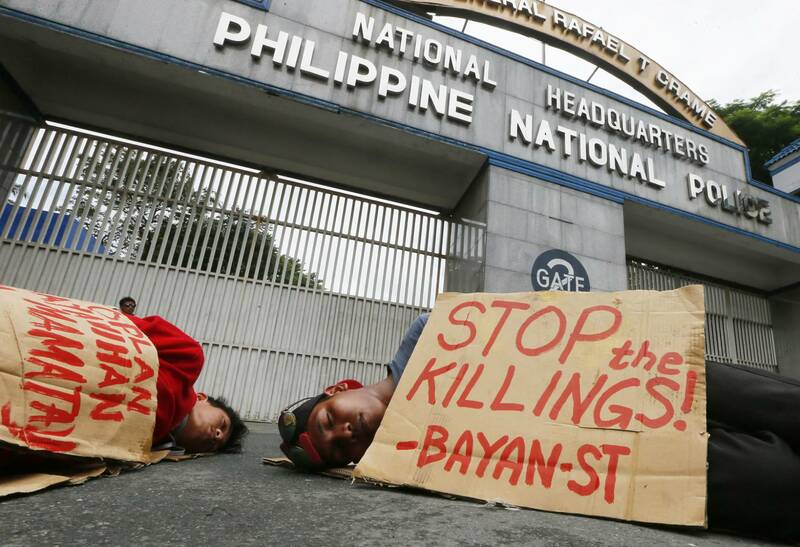 “Nanlaban” is what the police call a case when a suspect resists arrest and ends up dead. It means “he fought it out.” That is what they said about Florjohn Cruz, 34, whose body was being carted away by a funeral home when I arrived at his home in the poor Caloocan neighborhood just before 11 p.m. one night. His niece said they found a cardboard sign saying “Pusher at Adik Wag Tularan” — “Don’t be a pusher and an addict like him” — as they were cleaning Mr. Cruz’s blood from the floor near the family’s altar, shown in the middle photo below. 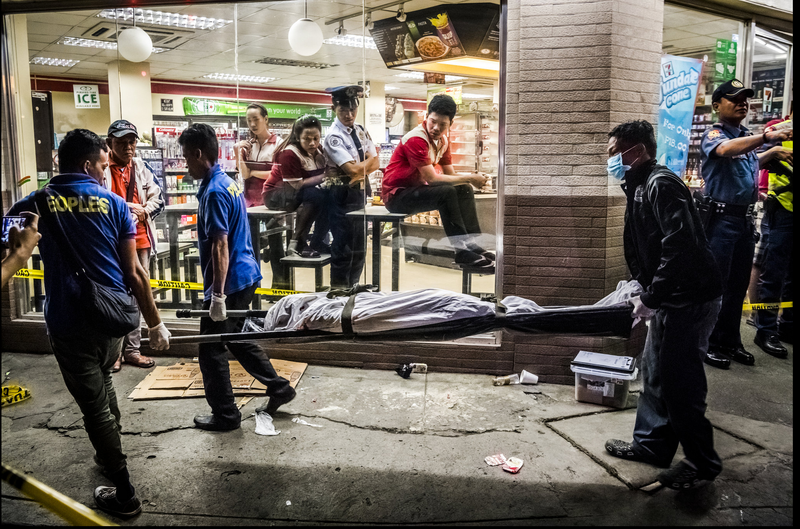 Funeral parlor workers carried away Edwin Mendoza Alon-Alon, 36, who was shot in the head outside a 7-Eleven store. 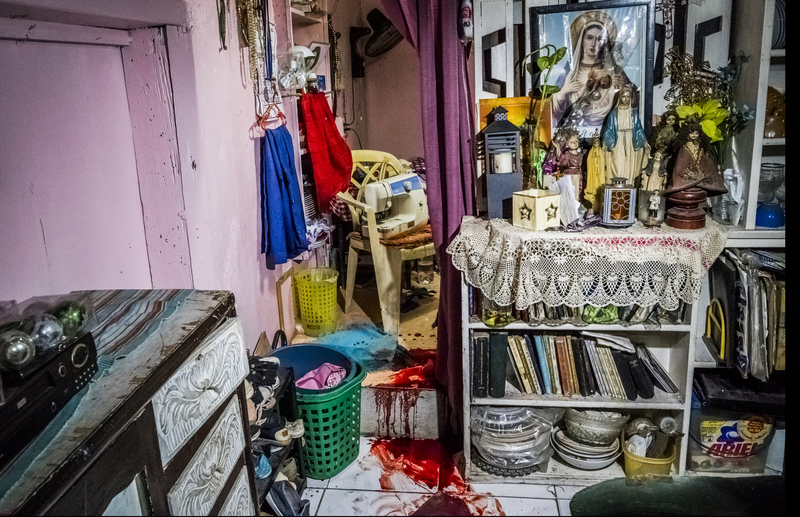 The blood of Florjohn Cruz, 34, stained the floor in his family’s living room, next to an altar displaying images and statues of the Virgin Mary, among other items. ‘Discarded’. Erika Angel Fernandez, 17, was one of three women among the 57 victims I photographed. She was killed alongside her boyfriend, Jericho Camitan, 23. His wife, Rita, told me, between pained cries, that Mr. Cruz had been fixing a transistor radio for his 71-year-old mother in the living room when armed men barged in and shot him dead. The family said Mr. Cruz was not a drug dealer, only a user of shabu, as Filipinos call methamphetamine. He had surrendered months earlier, responding to Mr. Duterte’s call, for what was supposed to be a drug-treatment program. The police came for him anyway. 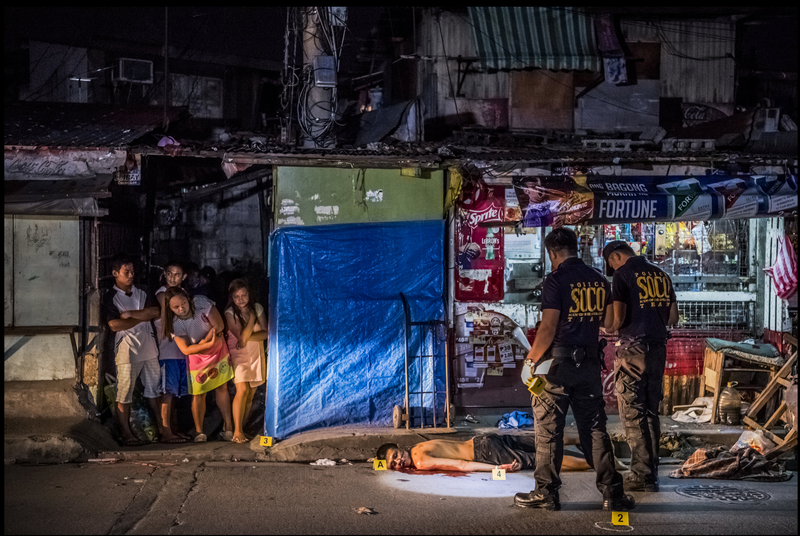 As my time in the Philippines wore on, the killings seemed to become more brazen. Police officers appeared to do little to hide their involvement in what were essentially extrajudicial executions. Nanlaban had become a dark joke. 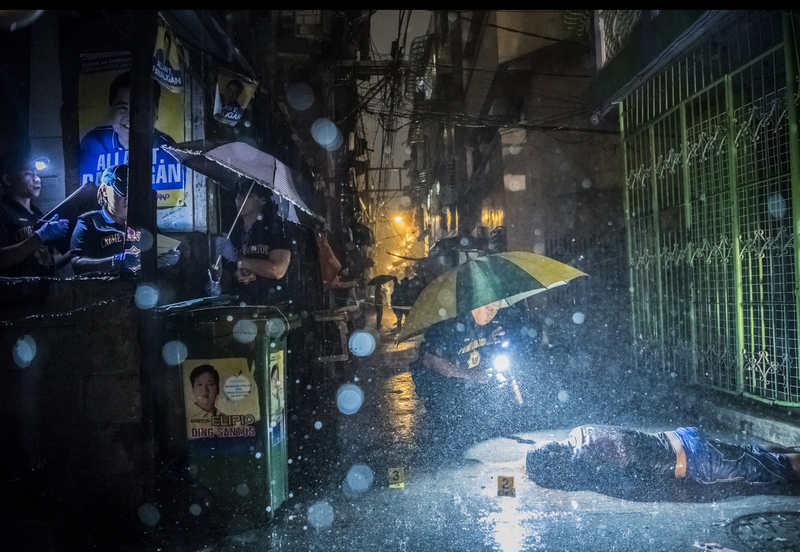 “There is a new way of dying in the Philippines,” said Redentor C. Ulsano, the police superintendent in the Tondo district. He smiled and held his wrists together in front of him, pretending to be handcuffed. Officers at the scene of Ronald Kalau’s death. The police report said Mr. Kalau drew a .38-caliber handgun when officers tried to arrest him as he bought methamphetamine. Neighbors said the police gunned him down in a house that was being used as a drug den. 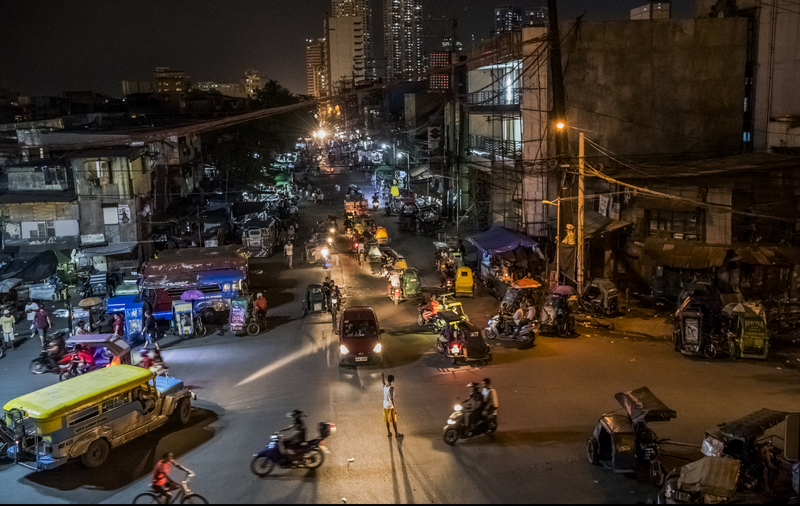 The Tondo neighborhood of Manila. 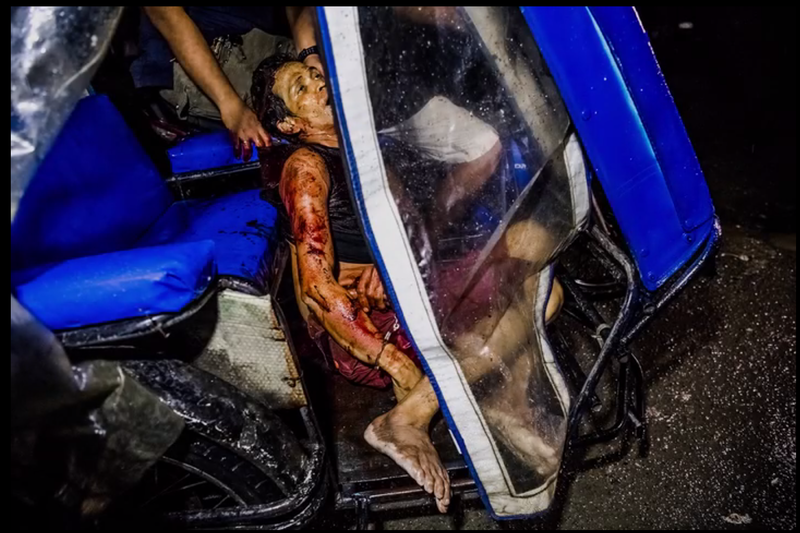 Roel Scott, 13, inspects the bloodied spot where his uncle, Joselito Jumaquio, 52, was killed by the police. Witnesses said they heard a woman shout “Nanlaban,” which means “fighting it out,” before they heard the gunshots. Mr. Cruz’s 16-year-old nephew, Eliam, and 18-year-old niece, Princess, said they had watched from a second-story porch as the plainclothes officers who had killed their uncle emerged from the house. Eliam and Princess said they heard the beep of a text message and watched as one of the men read it from his phone. “Ginebra’s won,” he announced to the others, referring to Barangay Ginebra San Miguel, the nation’s most popular basketball team, which had been battling for the championship across town. The teenagers said the men celebrated the team’s victory as their uncle was carried out in a body bag. 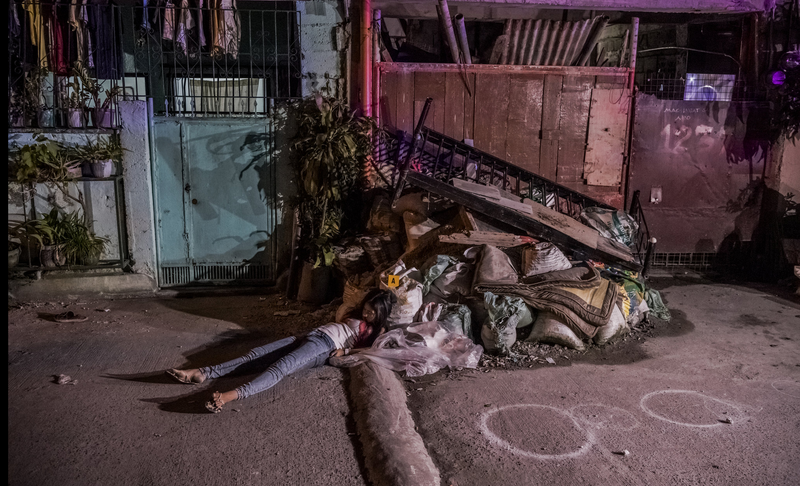 Roel Scott, 13, is one of the boys in the photo above, at the spot where his uncle, Joselito Jumaquio, was slain by a mob of masked men. Mourners often place candles in the blood of the victim to honor them. 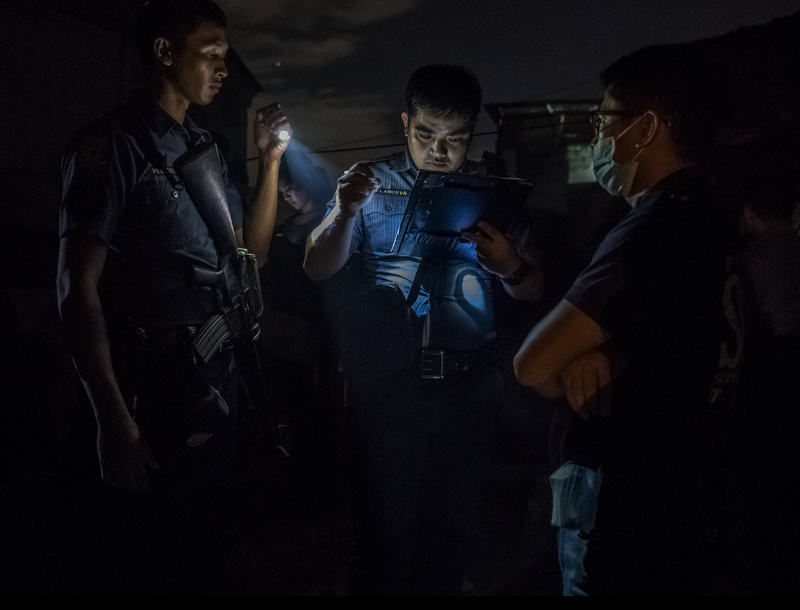 Roel said he was playing video games with Mr. Jumaquio, a pedicab driver who had also surrendered himself to the authorities, when 15 of the masked men descended quickly and silently over the shantytown called Pandacan. Witnesses told us the men dragged Mr. Jumaquio down an alley and shouted at gathering neighbors to go back into their homes and turn the lights off. They heard a woman shout, “Nanlaban!” He’s fighting it out. Two shots rang out. Then four more. 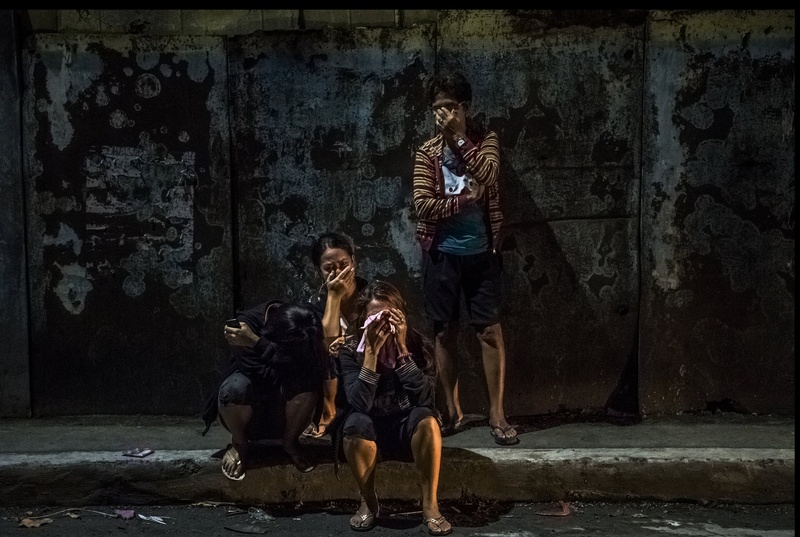 I also photographed wakes and funerals, a growing part of daily life under Mr. Duterte. Relatives and priests rarely mentioned the brutal causes of death. Family and friends attending the funeral of Mr. Jumaquio, who witnesses said was killed by a gang of masked men. 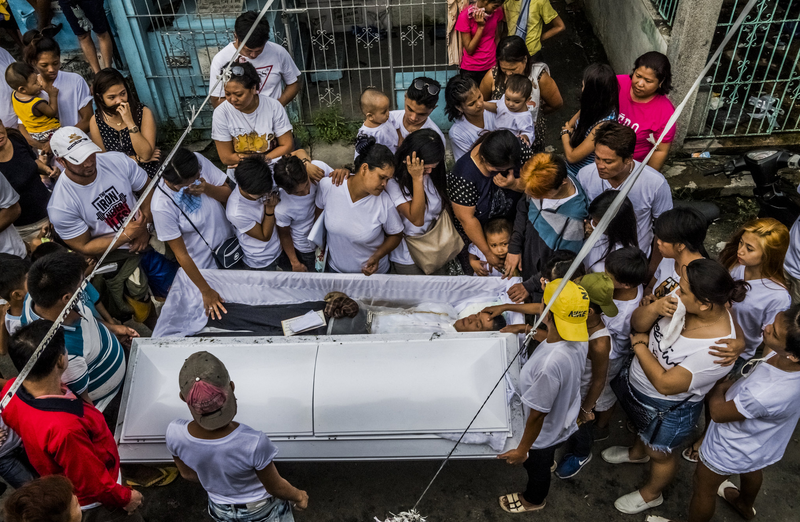 Bodies were stacked up at a funeral parlor as the families of victims like Danilo Deparine, whose body lay on a metal stretcher on the floor, struggle to pay for burial. Benjamin Visda, 43, had left a family birthday celebration to get something from a convenience store when he was snatched off the street and killed, according to relatives. Maria Mesa Deparine lost two sons in a single week in September. Both had turned themselves in to the police. Both were found dead under bridges. 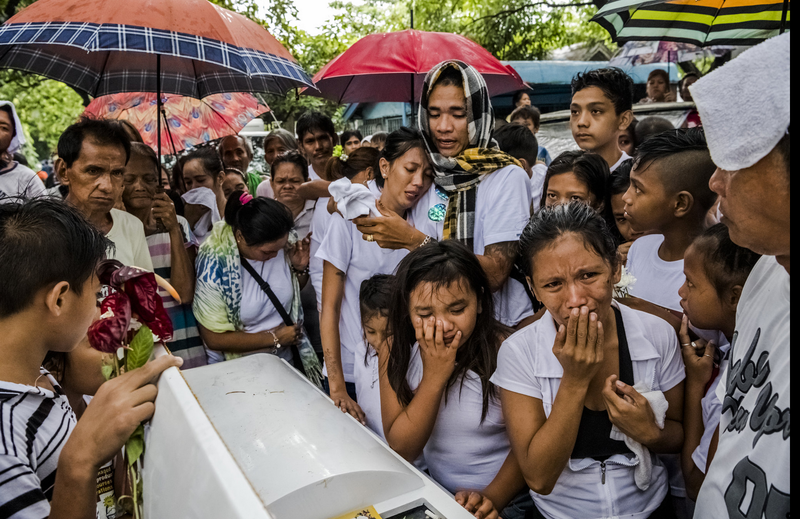 Ms. Deparine said it took her three weeks to collect loans and donations totaling 50,000 pesos, about $1,030, to pay for the burial of her baby, Aljon, who was 23. We went with her to the funeral home where she pleaded with the owners to reduce the fees for his brother, Danilo, 36. 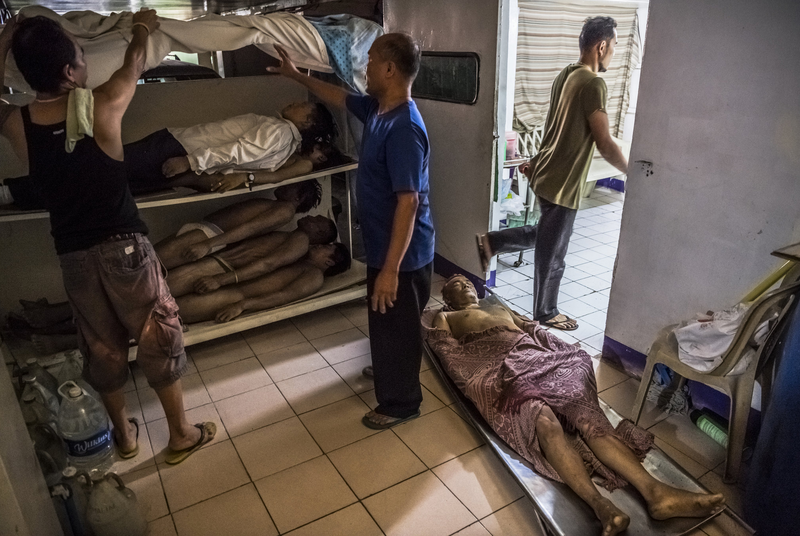 Danilo’s body, on the floor in the middle photo above, had already spent two weeks in the morgue, where the dead are stacked like firewood, with nothing separating them. The funeral directors agreed to a cut rate of 12,000 pesos, about $240, for a one-day wake instead of the usual week. Ms. Deparine left, unsure whether she could come up with the sum, or whether Danilo would end up in a mass grave with other victims of the president’s drug war. The police called this, too, a buy-bust operation, and said that Mr. Visda, while handcuffed, tried to grab an officer’s gun — Nanlaban — so they shot him. The video below, also taken from a security camera, shows him being loaded alive onto a motorcycle, sandwiched between two masked men. 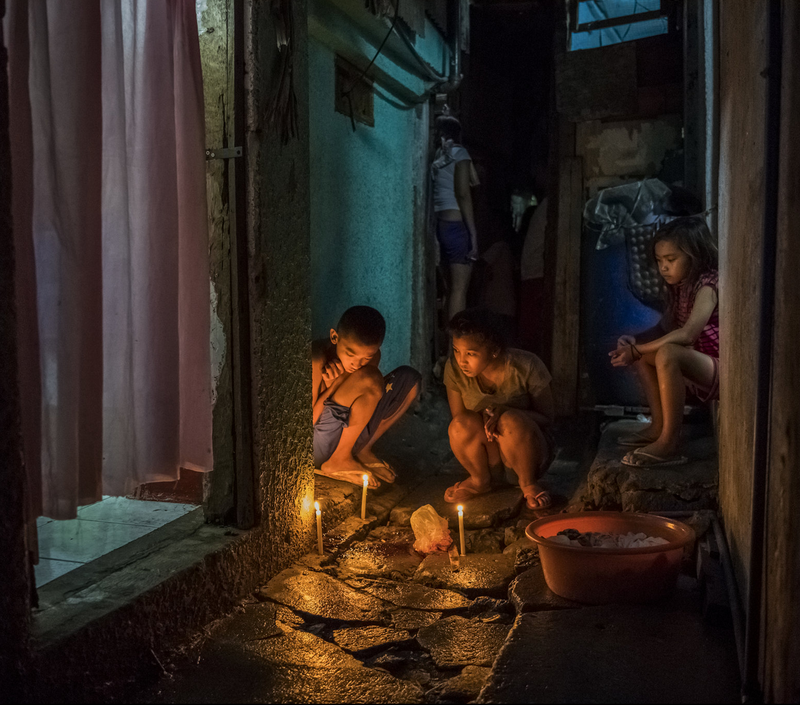 The same night Florjohn Cruz was killed, we found ourselves a few streets away an hour and a half later, at another home where a man had been murdered. It was raining that night, too. We heard the wrenching screams of Nellie Diaz, the new widow, before we saw her — shown in the middle photo below — crumpled over the body of her husband, Crisostomo, who was 51. 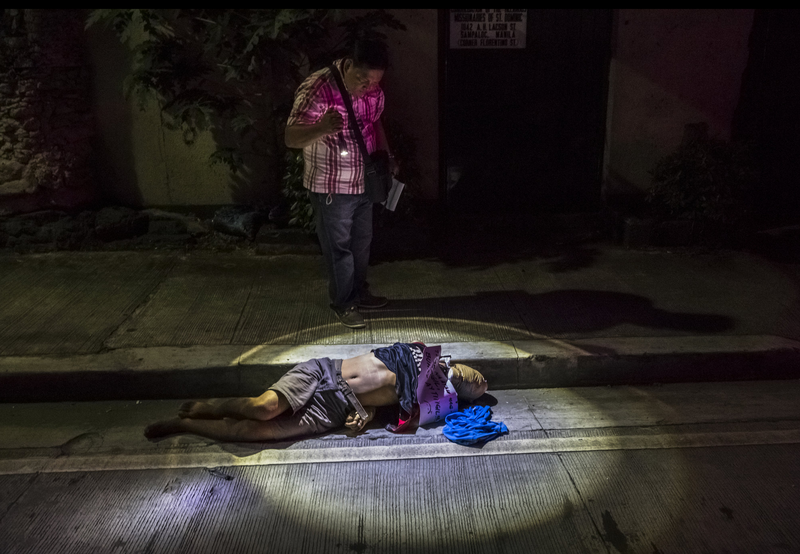 Nellie Diaz hunched over the body of her husband, Crisostomo, a drug user who had surrendered but still ended up dead. 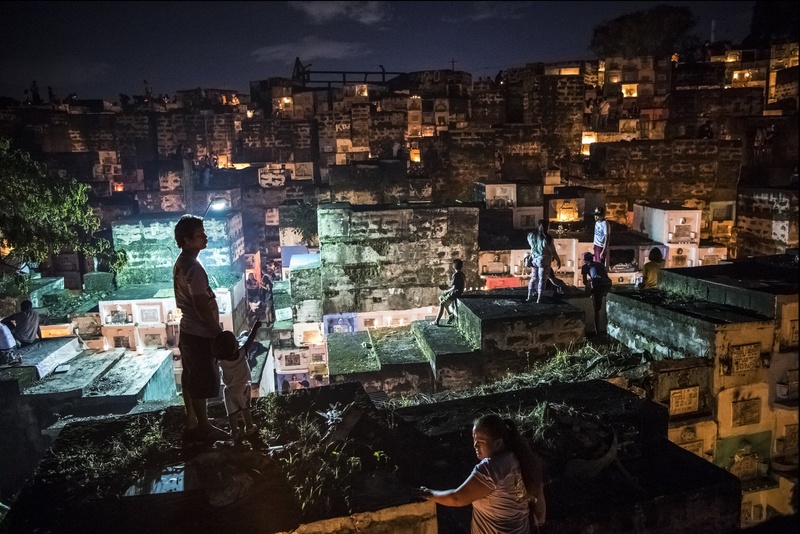 On Nov. 1, All Saints’ Day, the Barangka cemetery in Manila was busy as relatives visited graves. Mr. Diaz’s eldest son, J.R., 19, said a man in a motorcycle helmet kicked in the front door, followed by two others. The man in the helmet pointed a gun at Mr. Diaz, J.R. said; the second man pointed a gun at his 15-year-old brother, Jhon Rex. The third man held a piece of paper. J.R. said the man in the helmet said, “Goodbye, my friend,” before shooting his father in the chest. His body sank, but the man shot him twice more, in the head and cheeks. The children said the three men were laughing as they left. Relatives overcome with grief at the site where the bodies of Frederick Mafe and Arjay Lumbago lay sprawled in the middle of a street. Desde su llegada al poder, 1.900 personas han muerto por acción de la policía y patrullas de voluntarios en una cuestionable guerra a la delincuencia. Reconozcámoslo: la democracia es aburrida. Recoger la basura y pagar las nóminas no tiene nada de épico. La democracia tiene más de jardinero que de carpintero. Ante un terreno que es necesario transformar, el primero debe tener mucha paciencia, iniciar cambios con un final incierto, bregar con las dificultades que puedan llegar, aceptar que el resultado —que será visible a muy largo plazo— no sea el previsto y dejar que las cosas sigan su curso. El segundo puede actuar más rápidamente. Puede controlar más cada detalle y conseguir el resultado planificado. Pasado el tiempo, el buen jardinero conseguirá un hermoso paisaje y el buen carpintero un espectacular decorado. Y luego están los falsos carpinteros. Los del “esto lo hace cualquiera” o el “esto lo arreglo yo en un plis plas, con un par de tablones y cuatro clavos”. El panorama político se ha llenado de estos últimos. No son un fenómeno nuevo, pero vivimos una época donde la aburrida democracia pide paciencia de jardinero ante importantes problemas. O un buen carpintero, pero estos son menos hábiles con la lengua que con las herramientas. Los del plis plas son más ingeniosos, se saltan cualquier norma con más gracia, mueven más seguidores o detractores en Internet. Se comen el escenario. Filipinas es un paisaje con gravísimos problemas. Entre ellos destacan el crimen organizado y la corrupción. Hace apenas siete semanas asumió la presidencia uno de esos políticos que proponen soluciones simples a problemas complejos, que consideran que las personas que saben —los expertos— son un estorbo y que la paciencia democrática es algo obsoleto. Rodrigo Duterte llegó al poder prometiendo 100.000 muertes de quienes considera criminales. En Davao, ciudad de la que era alcalde, se le acusa de apoyar a un grupo de sicarios que ha matado a 1.000 personas. Apodado El Castigador y Harry el sucio —y él, encantado, claro— se hizo famoso durante la campaña electoral por las barbaridades que soltó. A Duterte le daba igual todo. Pidió a los filipinos que si conocen a algún drogadicto lo asesinaran porque “sería doloroso pedirles a sus padres que lo hicieran”. Recordando a una misionera violada y asesinada en 1989 durante un motín carcelario, declaró que era “una pena” porque “era muy guapa” y que el alcaide debía de haberla violado primero. Su concepto de la diplomacia también es curioso. Del papa Francisco dijo que era “un hijo de puta” porque su visita a Manila había provocado atascos. Probablemente Francisco prefiere compartir puesto con los drogadictos y la misionera que figurar en la lista de héroes de Duterte. Desde su llegada al poder, 1.900 personas han muerto por acción de la policía y patrullas de voluntarios en una cuestionable guerra a la delincuencia. De ellas, 756 han fallecido por “oponer resistencia” a la policía. Los 1.100 restantes, a manos de las patrullas. La ONU ha puesto el grito en el cielo y la oposición también. Duterte ha amenazado a la primera con expulsarla del país y a la segunda con la posibilidad de que sus miembros “sean asesinados” si bloquean su ofensiva contra el crimen. El Castigador está castigando a Filipinas. A ver quién es el jardinero/carpintero que la arregla luego.